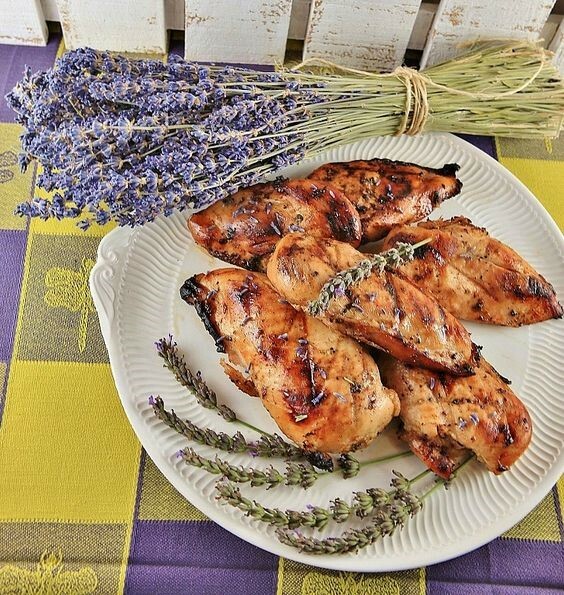 Warm it up this winter by adding Culinary Lavender to your dinner! Here are a few of our favorite winter dishes, sides, desserts and drinks. 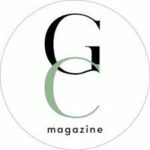 This recipe was found at A Quiet Life Blog. In a large bowl, mix the vinegar, lemon zest, lemon juice, honey, lavender, lime juice, salt and pepper. Add chicken and coat. Cover and refrigerate for 4 hours. Preheat a grill to medium. Remove the chicken from the marinade and place, skin side down, on the grill. Cook, turning every 5 minutes and brushing with the marinade for 15 minutes or until the chicken is no longer pink when tested with a sharp knife. Serve and Enjoy! This recipe was found on You Beauty Blog. 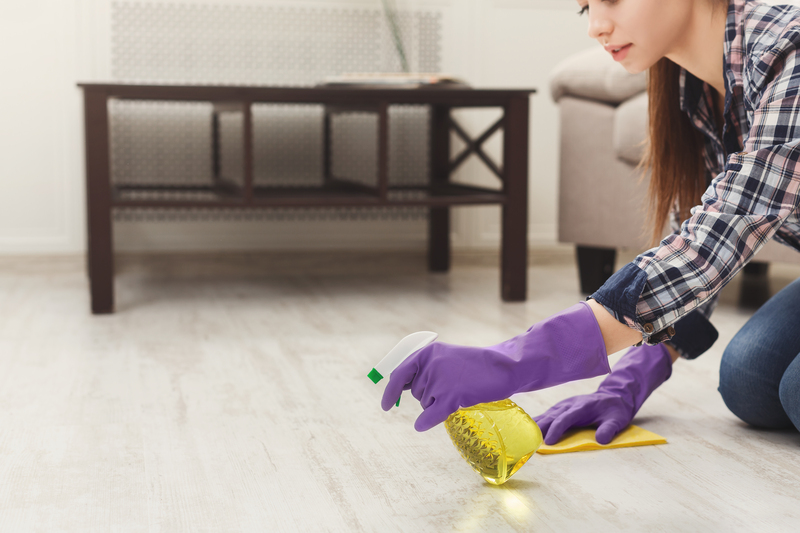 Mix the olive oil, white wine, lavender and lemon juice in a large bowl. Add pepper to taste. Place the filets in the resulting marinade and refrigerate for 30 minutes. During this time, pre-heat the barbecue on medium heat. Cook the salmon, wrapped in aluminum foil, and cook over barbecue for approximately 12 to 15 minutes while keeping the cover closed. While cooking, turn and liberally baste the salmon with the marinade. Add salt and pepper to taste. Serve with steamed potatoes or a salad. This recipe was found on the Spoon University website. 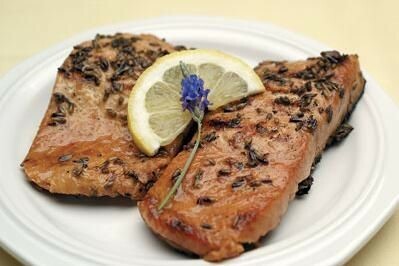 Season pork chop with lavender, oregano, salt and chili flakes to taste. 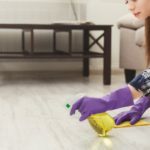 Cover both sides and edges thoroughly. Heat sauté pan and olive oil on medium-high heat until the oil moves on its own or just begins to smoke. 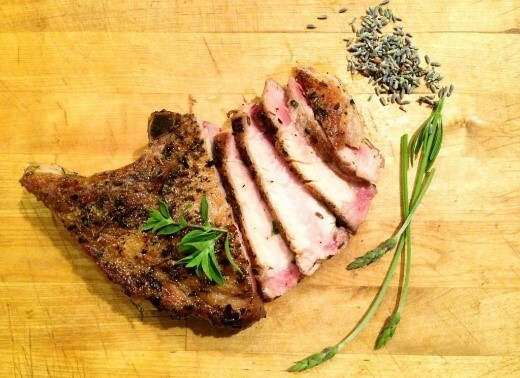 Sear pork chop 4 to 5 minutes on each side — depending on the thickness of the chop and temperature of your pan —until nicely browned on both sides. Add the pat of butter to the pan and baste the pork chop. Continue cooking until browned well on both sides. For medium-well, the chop should be firm to the touch. This recipe was found on Boulder Locavore. Preheat oven to 350 degrees*. 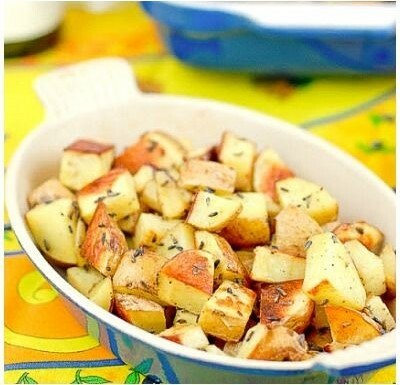 Scrub potatoes, cut out any bad spots and cut into bite-sized pieces. Do not peel. Toss in a bowl with olive oil. When coated with the olive oil, add lavender, salt and pepper. Spread into a single layer in a roasting pan or on a baking sheet. Place in the oven for 30 minutes, stirring part way through to ensure even browning. Potatoes are done then soft inside to the bite. This recipe was found on Curly Girl Kitchen’s website. 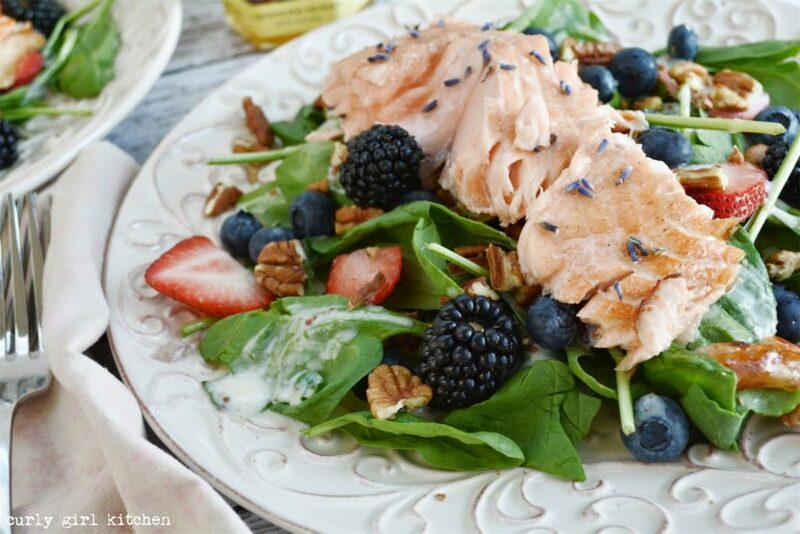 Serve with the salad and dressing then garnish the salmon with a little dried lavender. This recipe is found on The Baker Mama’s blog. In a large mixing bowl, whisk together the flour, sugar, baking powder, baking soda and salt. Add the cold butter to the flour mixture and cut it in with a pastry blender or two knives moving in opposite directions until a crumbly mixture forms. 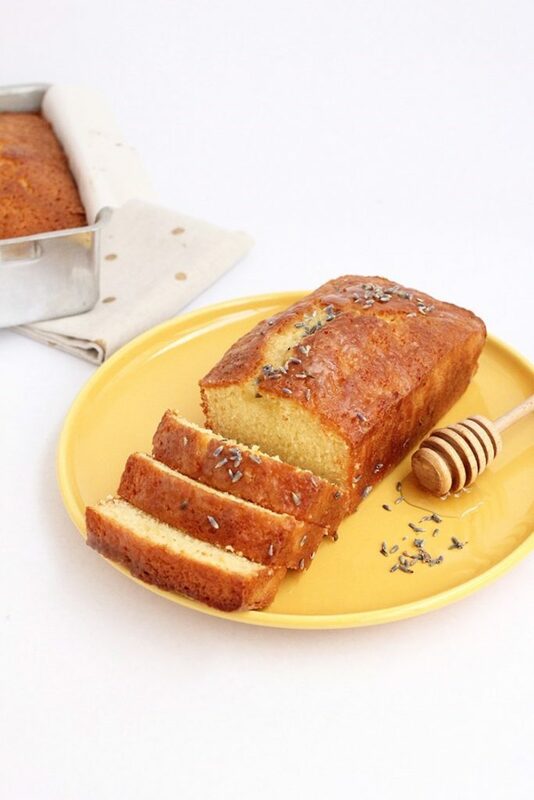 Add the zest of both lemons to the mixing bowl along with the poppy seeds and lavender. Stir gently to combine. Make a well in the center of the mixture and add 3 tablespoons lemon juice, milk and egg. Stir with a spoon until mixture starts to come together and then gently and quickly mix with your hands until all flour is incorporated. Transfer the dough to a very lightly floured surface and form into a circle just under 1-inch thick. Cut into 8 wedges and transfer them to the prepared baking sheet. 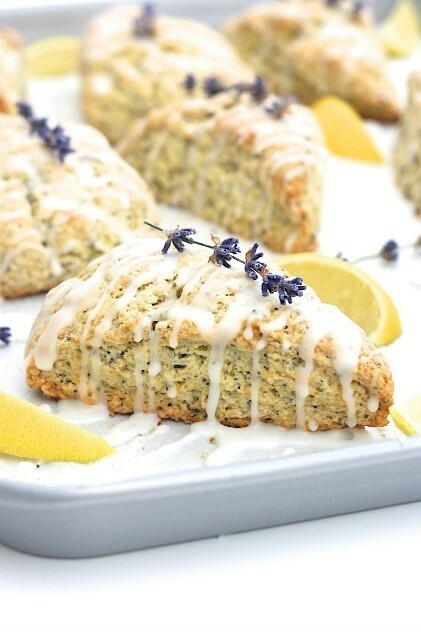 Brush the top of each scone with a little melted butter and sprinkle with a pinch of granulated sugar. In a small mixing bowl, whisk the confectioner’s sugar with 2 tablespoons fresh lemon juice until smooth and of drizzling consistency. Add additional confectioner’s sugar if glaze is too thin or lemon juice if it’s too thick. This recipe was found on Freut Cake’s website. Preheat the oven to 350 degrees. Grease the bottom of an 8 1/2 x 4 1/2 x 2 1/2-inch loaf pan or two mini loaf pans. Line the bottom with parchment paper, then grease and flour the pan. In the bowl of an electric mixer fitted with the paddle attachment, cream the butter and sugar on medium speed for 3 to 4 minutes, until light. Meanwhile, put the eggs, honey, vanilla, and lemon zest in a glass measuring cup but do not combine. With the mixer on medium-low speed, add the egg mixture, one egg at a time, scraping down the bowl and allowing each egg to become incorporated before adding the next egg. Sift together the flour, salt, and baking powder. With the mixer on low-speed, add it slowly to the batter until just combined. Finish mixing the batter with a rubber spatula and pour it into the prepared pan. Smooth the top. Bake for 50 to 60 minutes, until a toothpick inserted in the center comes out clean. (If you are baking two mini loaves bake for 50 minutes.) Cool for 15 minutes, turn out onto a baking rack, and cool completely before glazing. In a small bowl combine confectioners sugar, honey and warm water. Wisk together until smooth. Drizzle over cooled pound cake and serve! 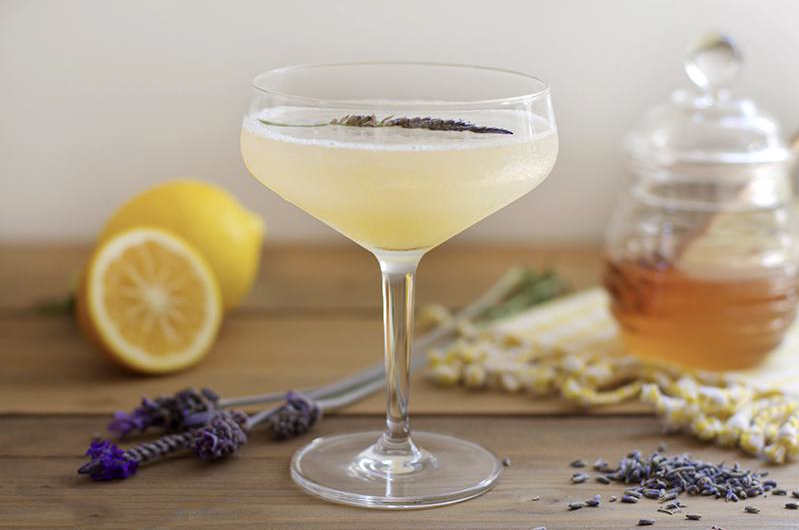 Add the gin and honey into a shaker and stir to dissolve the honey. Shake and strain into a cocktail coupe. This recipe was found on Sugar Hero. 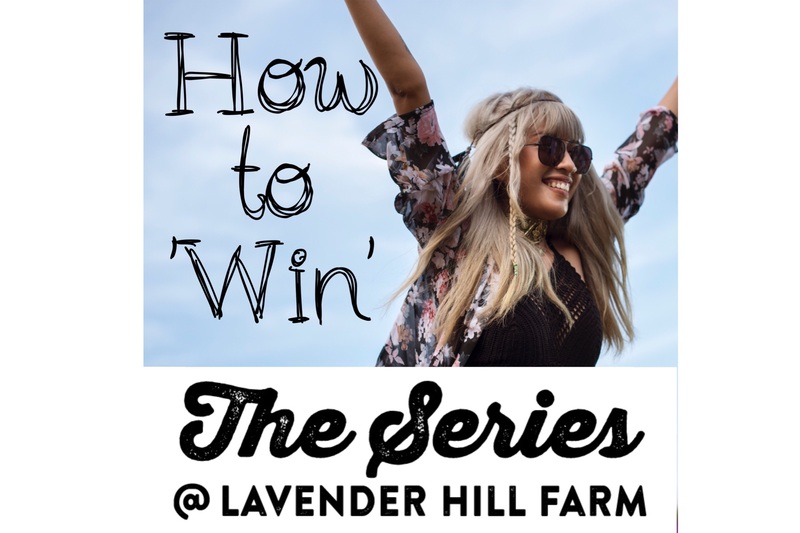 After 30 minutes, pour the milk through a strainer into a bowl to remove the lavender, then return the milk to the saucepan. Put the pan on the heat and bring it back to a simmer, but don’t let it boil. Remove the pan from the heat and add the chopped milk chocolate, dark chocolate, salt, and vanilla extract. Whisk everything together until the chocolate is melted and the mixture is smooth. 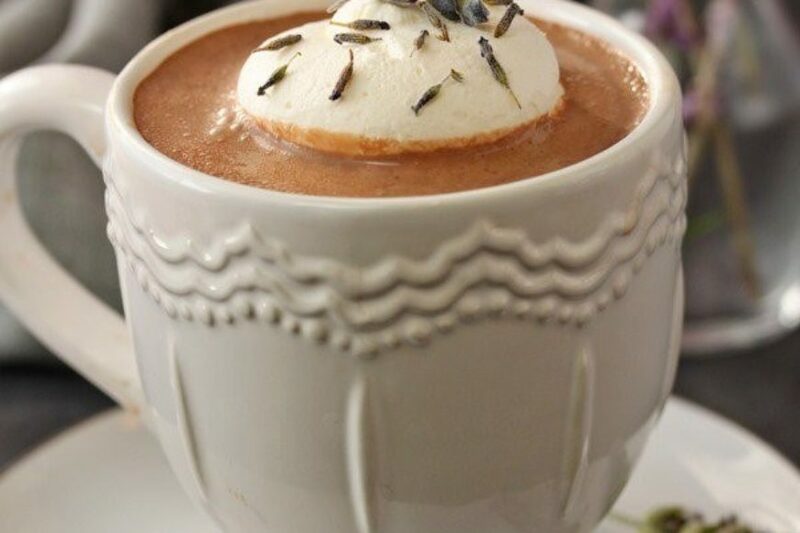 Pour into mugs and top with whipped cream. 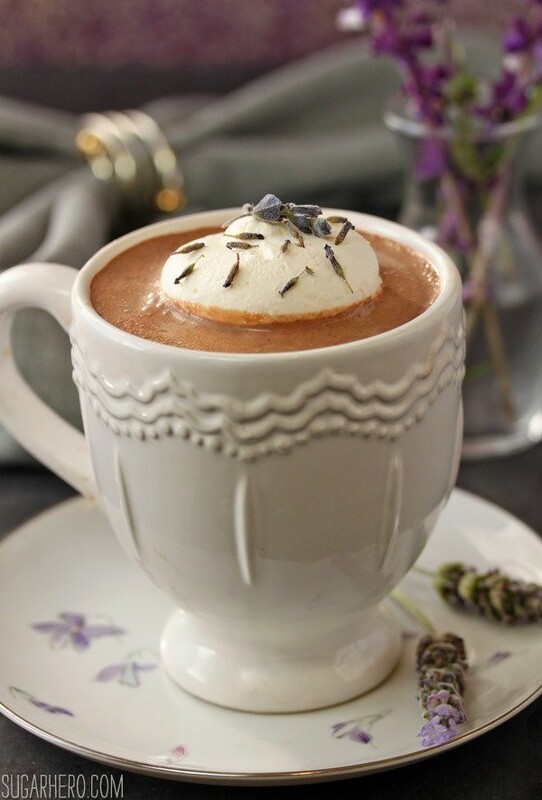 Lavender Hot Chocolate can be made in advance and stored in the refrigerator for up to a week. Reheat in the microwave or on the stovetop. 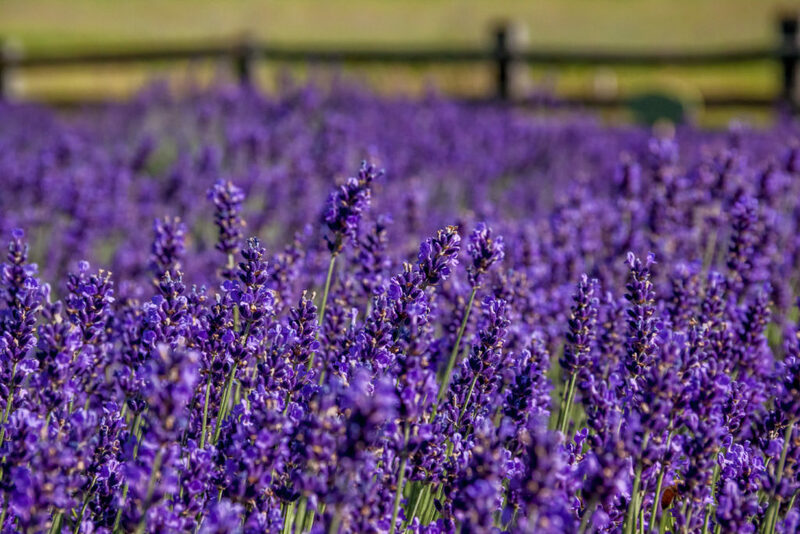 We hope you enjoy cooking with Lavender, share photos of your creations with us on Facebook or Instagram! 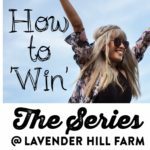 #LHFarm Thank you for all of the recipe bloggers out there that make it so simple to cook with our favorite herb!